First things first, 20,000 + footprints is a huge number for a lousy blogger like me. Thank you so much for bearing with me and still reading every thing that I write. Secondly, you feel overwhelmed when you go to people who matter to you to ask about what they would like for their b'day gift and they blatantly reply that since you are good writer, write a book for me. It makes you happy, it makes you feel pressurized and it makes you feel special! So it's Tanvi's birthday today! She turns 21 today and she is the youngest of the small yet beautiful group of people I love to spend all the time that I can manage to. Does that mean I dedicate a post to anyone and everyone? No. And also, someone need not to be family or a soul-mate or the love- of- your- life to be special. Some people are just who they are to you. That is what Tanvi is to me. So this girl, whom I met on one fateful morning in the month of July 2013, told me that she would really love if I gifted her a book for her b'day, that I was written by me, about her..us. I am still in the process of writing that book. May be by her 22nd b'day she will get it. This blog post is a teaser to that book that is yet to be written. I really thought that it would be an easy task, scribbling certain lines here- about her, about us and about our lives together so far. But trust me its not that easy a task. I can start with writing the usual things like how she means a lot me and how she understands me so well, but that won't keep this post as special as she is. I don't support being judgmental, but at times you need help to see if you could put all of your trust in a person and this girl makes that easy for me. She will give me the most rational opinion about anyone or anything. At times, when I tend to get impulsive, she knows what to say exactly. I don't know what her intentions behind that are - to calm me down, to just give an opinion or may be its me imagining things- but they help me be less impulsive. She is that girl to whom I can go and just spill out certain words, which doesn't make any sense or sentence, and say "samajh rahi hai na?" and the answer is always going to be in affirmative. I can never understand her sense of humor. But I still like it. *Sigh* Certain things that come with the package, you can not really ignore them. Well, but trust me, she can kill you with her jokes. She is one smart girl with loads of grey cells and even greater amount of confidence. Her photographs her deceptive. Really deceptive. She is not that innocent. She is really naughty. And what can surprise a sane person is the amount of sense that comes out of this girl who does all sort of insanely naughty things. And I am not exaggerating. She doesn't like many people, so yes, I am sort of lucky to be among those few people of her life, whom she genuinely likes and cares for. She makes sure that I am not left out ever. And yes, one more thing, she has a very scary and devilish laughter. I can't praise you more than this, Tanvi. Enough for today and another 365 days to come. Many many happy returns of the day. I really hope that you are happy today and for the rest of the years to come. I love you. 20,000 page views is a real achievement dear :) Congos! 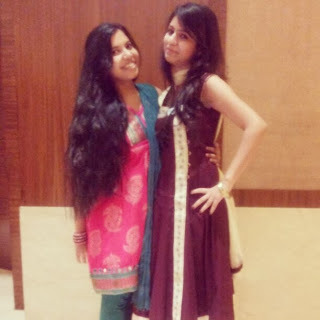 You have a very cute blog and a very happy birthday to your friend Tanvi!